Here is a beginning of backblogs form the NMC Regional Conference last week. Of course, you may say I may be raving since I work for NMC, but this was a fab conference, with a small enough number of people there that you could converse with all of them over the 2 days of sessions. The program was outstanding! On day 1, Ed Lamoureux, barely making it to San Antonio after bad weather in Illinois, shared his experiences in planning a 3 week course at Bradley University he will teach in January 2006. 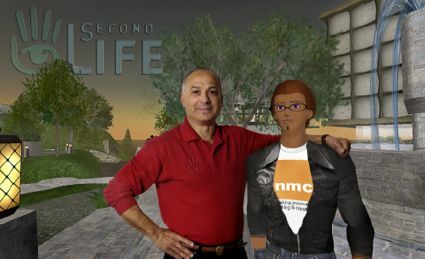 Ed dove head first into Second Life, but not without a great deal of fore thought, in dealing with a complex set of issues to prepare his students to now only hold all of their classes in Second Life, but to also engage in social research within the environment. as well as the articles he is writing for us on the NMC Campus Observer.